I love the interviews that Collector's Weekly does with various vintage jewelry experts around the country. 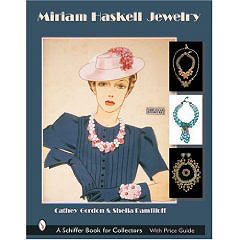 They are always a good read and full of interesting vintage jewelry tidbits. The latest interview is with Sheila Pamfiloff, co-author of the resource book "Miriam Haskell Jewelry" that I mentioned in a previous blog post about vintage jewelry books. This book is considered the resource book about this fascinating designer. The interviewer talks with Sheila about her background in collecting vintage jewelry, and also discusses with her, in great length, about the highly collectible vintage jewelry designer, Miriam Haskell, and her jewelry designs. The article is fairly comprehensive and discusses Haskell's collaboration with Frank Hess, her head designer, as well as giving lots of information about her design techniques. If you love Miriam Haskell designs and want more information, this interview with Sheila Pamfiloff is a great place to start. The Book Miriam Haskell Jewely is also available at leading book retailers as well as many online sites, such as Amazon. I have a copy and use it all the time. Labels: Collector's Weekly, Miriam Haskell Jewelry, Sheila Pamfiloff, vintage jewelry resource books. I don't even know how I ended up here, however I believed this put up was good. I do not recognize who you are however certainly you're going to a well-known blogger for those who are not already.